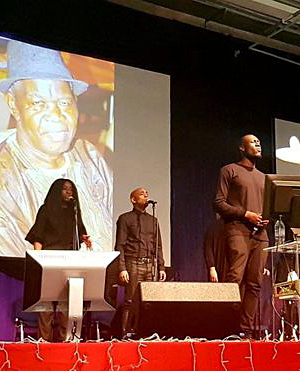 Top grime and hip hop artist Stormzy turned up to sing at the funeral of a fan’s father in Reading just before Christmas, after seeing a message on Twitter. Nasir Bockarie lost his father on 8 December, the day of his graduation, and sent the singer a message via the social media channel inviting him to sing Blinded By Your Grace – a song both he and his father loved – at the funeral. “Don’t worry if you can’t,” he added. “I just thought I’d try my luck”. He was stunned when the singer agreed and came to the funeral with a few members of his team. One of the mourners tweeted a photo of the star standing at the pulpit in front of a photo of Mr Bockarie. Nasir later posted on Twitter: “I'm actually speechless, praise god for humanity … Massive respect for @Stormzy1 for honouring this. God Bless You."